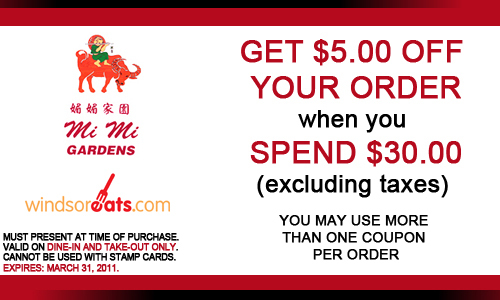 For the month of March, Mi Mi Gardens will be offering this coupon for $5.00 off your order when you spend $30.00, excluding taxes. The great thing is you may use more than one coupon per order. For example if you spend $30.00, save $5.00. If you spend $60.00, save $10.00. If you spend $90.00, save $15.00 and so on. You must present the coupon at the time of purchase and it cannot be used with stamp cards. Please print out the coupon and bring it in as it is only available for dine-in and take-out only.